Bing Werke, traditionally a producer of tin toys entered the typewriter market in 1927 with a light typewriter. The sheet metal machine was not intended for heavy office use, but it was not a toy either. It was a "Lehrmittelschreibmaschine", an educational tool. 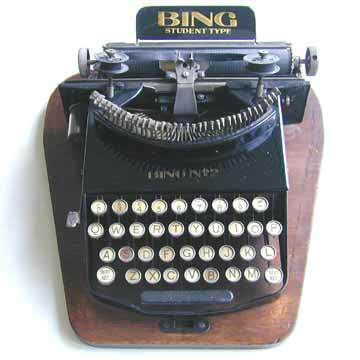 The Bing originally appeared with an ink pad system for inking the type (see Bing 1). The second model held a narrow ribbon. Both the Bing 1 and 2 appeared with a metal base and cover. The model presented here is a Bing 2 Student that has a wooden base and nickel-rimmed keys. The other models had aluminium keytops. The 'student' Bing also appears in ivory white. The Bing was not produced very long and is relatively rare. However, because the machines have no serial numbers, it is unknown how many were actually produced.